Once again I had the opportunity to team up with Bryan Humphrey and the The Rogue V100 for a HUGE G.I.JOE / Cobra shoot. 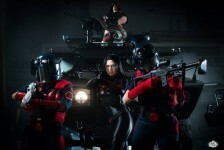 (You might recognize the tank from the “Wade Wilson’s War” shoot a few years ago). This was a massive shoot that took place on the grounds of On Site Machine Works & hosted around 100 Cobra/Joe cosplayers. I can’t express how cool it is to be able to climb all over tanks/assault vehicles and handle real weaponry. It brought a level of awesome to these images, that would have been impossible to achieve w/o them! Big thanks to Brian for being such a dynamically RAD photographer and allowing us to attend his event. To The Rogue V100 and the OSMW for letting us play with your toys. You guys are the best! And NOW……….. For the pics! March 14, 2016 | Filed under Uncategorized and tagged with Atlanta, Baroness, Brian Humphrey, Burns, catsuit, Chris, COBRA, Comics, cosplay, costume, G.I. Joe, Georgia, GI Joe, guns, Miracole, officer, OSMW, photo shoot, Photography, photoshoot, tank, The Rise Of Cobra, The Rogue V100, Viper, Zartan.